WHY CAN’T THEY BE THROWN IN THE GARBAGE ? Lithium ion batteries are not yet classified as hazardous waste by the United States Government, but there are many reasons to recycle these batteries rather than throw them away where they may end up in a regular landfill. Exposure to the elements in these batteries can lead to respiratory problems and, in some cases, skin rashes. In many states, it is illegal to throw away lithium ion batteries. This is because they enter the solid waste stream and contaminate soil and water. In addition, if this kind of battery is subjected to high temperatures, it may explode. In the United States, there are a large number of recycling centers available all over the country. To locate a center near you, you can call 1-800-8-BATTERY or 1-877-2-RECYCLE. People can also visit https://www.call2recycle.org/locator/ and use the recycling center locater on the website. There are a number of companies that have signed up to be battery recycling collection centers so bringing the battery to any franchise of these companies will be sufficient. The list of companies includes Alltel, AT&T, Best Buy, Black & Decker, DeWalt, The Home Depot, Interstate All Battery Centers, Lowe’s, Milwaukee Electrical Tool, Office Depot, Orchard Supply, Porter Cable Service Centers, RadioShack, Remington Product Company, Sears, Staples, Target, US Cellular and Verizon Wireless. The collected batteries are sent to recycling facilities where the materials that make up the battery are separated. These materials include cadmium, nickel, cobalt, iron and lead. These materials are then crafted into new products including stainless steel and new batteries. According to the organization Call 2 Recycle, the Environmental Protection Agency has agreed that this is the best demonstrated available technology. A: Each device can accept different Amps. Apple devices charge using up to 2.4 Amps, while most Android and Windows devices charge using up to 2.1 Amps. This is what makes the Smart Chip Technology important. ZipKord chargers can automatically detect what power output your device needs and automatically regulates the power flow. Q: Since Apple has the MFI certification, is there a similar certification for Android devices? A: Currently Apple is the only manufacturer that has a certification program. Q: What does MFI mean? A: MFI means “(“Made for iPhone/iPod/iPad”)”. It’s an Apple licensing program guaranteeing a device is compatible with Apple products. Non-MFI Certified products may damage your phone and may not work with your device when Apple releases software updates. Q: What is Bluetooth 4.1? A: Bluetooth 4.1 will now work seamlessly with 4G and uses the power of smart connectivity to reduce battery drain. Bluetooth 4.1 devices can also connect directly to other Bluetooth enabled devices without using a phone or “middle man”. The third new feature is improved Data Transfer. See more here! A: USB-C is becoming the new standard for charging and data transfer. USB-C has a reversible tip and can transfer power or data faster than any other standard cable. USB-C is bi-directional, meaning it can send or receive power. Q: What Phone Brands currently use USB-C? A: USB-C is available in specific models of phones made by Samsung, Motorola, Google, LG, HTC and will soon be coupled with the Apple iPhone Lightning tip to take advantage of all the features USB-C has to offer, including a reversible tip that can transfer power or data faster than any other standard cable. USB-C is bi-directional, meaning it can send or receive power and works with HDMI as well. Q: What’s the difference between a shared port and designated ports? A: Dual charging devices such as our Rockz power banks or wall and car adapters can charge two devices at once. Shared ports are when each device is pulling from the same power pool thus splitting the power output. ‘Designated ports’ mean that regardless of the number of devices being charged simultaneously, each device will get the maximum amount of power supplied by that port. A: Yes, please see our Web Store. Q: I dropped my phone and the screen protector cracked, is it covered under warranty? A: Technically, no. Our warranty covers manufacturer defects which refers to the way the product was made. When the screen protector cracks but protects your actual phone screen it has done it’s job. Q: Lifetime Warranty…is it really Lifetime? A: Yes! We warranty all ZipKord products against manufacture defect for the lifetime of the product. If your cat chews your cable…that may not be covered. Click Here for more information. Q: My Battery Backup is damaged, what do I do? A: If you have a damaged or leaking battery, please exercise caution to avoid contact with any leaking substance. To handle a leaking battery, you should wear gloves and eye protection if possible, handle carefully, wrap the battery in a plastic bag and store in a cool environment until you can transport to a recycling center. Under no circumstances should you ship a leaking or damaged battery. Please take a picture and send to us through our warranty request form, and we will reach out to you with further instructions. 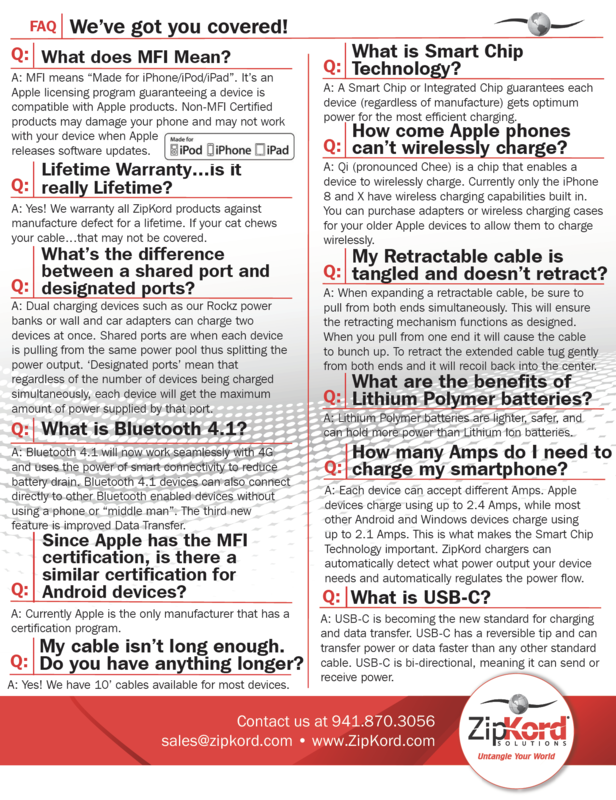 A: All of our products are MFI approved, which means that they are all Apple certified. First – please restart your phone as that often fixes this issue. If that does not work and you have been using our product and this is only recently showing up, it is most likely because the wires may have been damaged. Please send the cable back to us through our Warranty process. Q: My Retractable cable is tangled and doesn’t retract? A: When expanding a retractable cable, be sure to pull from both ends simultaneously. This will ensure the retracting mechanism functions as designed. When you pull from one end it will cause the cable to bunch up. To retract the extended cable tug gently from both ends and it will recoil back into the center. A: Unless the product was purchased directly from our Company, we are unable to issue a refund. We suggest you check your receipt from the store you made the original purchase for their refund policy. A: Check your receipt! Retail locations will provide you a receipt at the time of your purchase that will outline their return/exchange policy for accessories. If your item falls outside of that time frame please contact us! A: We guarantee our products over their lifetime and any return is an even or upgraded exchange based on inventory. When we ship the new item to you we cover that cost (even exchange).